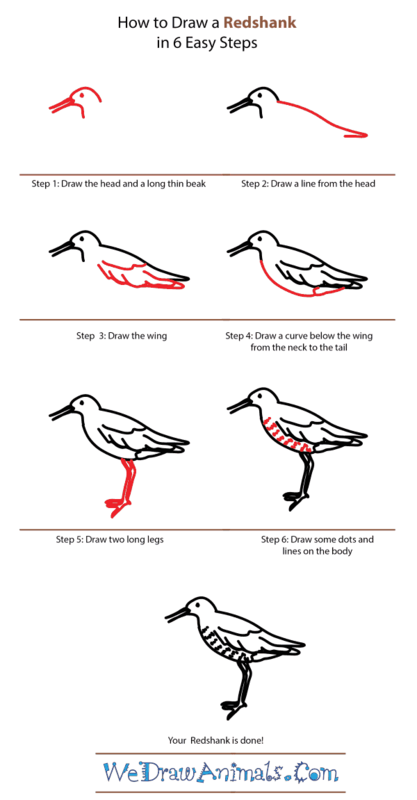 In this quick tutorial you'll learn how to draw a Redshank in 6 easy steps - great for kids and novice artists. 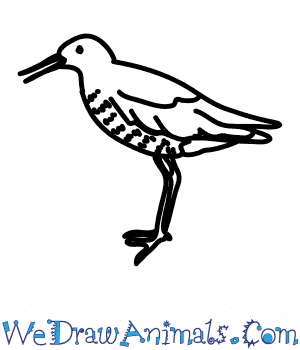 At the bottom you can read some interesting facts about the Redshank. The red shank is a brown-colored bird that has a marbled appearance during its mating season, though in winter time their plumage is much more plain and pale. Their underbellies are consistently lighter in tone than the rest of their bodies. Most notable about the appearance of the red shank, however, are its red legs and red bill that has a black tip on the end of it. 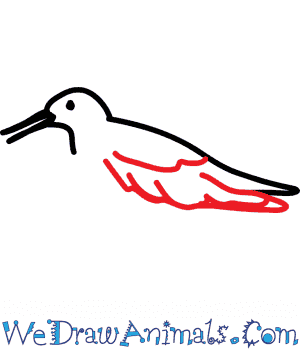 Their wings have splotches of white on them that are only visible when the bird is in flight over its native Eurasia. They will nest on nearly any wetlands, but will not usually be seen outside of Eurasia. The red shank is classified as a wading bird, and shares the common diet of all waders that prefer to eat small invertebrates. The red shank nests in large groups, and will lay three to five lightly colored eggs that are marked with brown speckling. 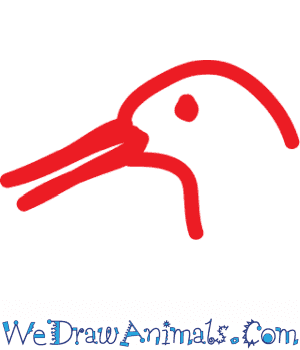 They are a migratory species of bird, wintering on the coasts around the Mediterranean Sea, as well on the Atlantic coasts of Europe and South Asia. This bird is far more wary and noisy than many other types of waders, as they have a very loud call that they will use to alert other birds when they feel alarmed. 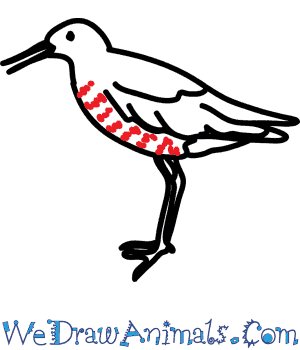 For a brief time, the red shank was recorded to be on Palau in Micronesia, during the mid-1970s and the year 2000. 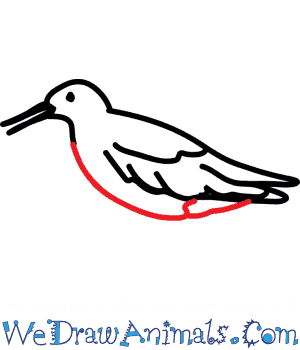 Arts and Crafts Activity Notes: Have every participant draw their own red shank, and proceed to color them in with colored pencils, markers or crayons. 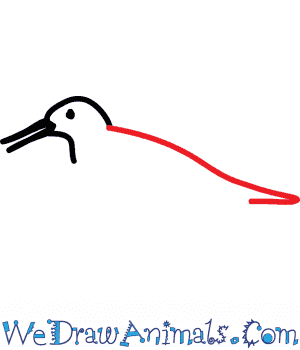 Instruct them to cut out their finished bird, and then using tape or Velcro, fix the birds onto a world map. 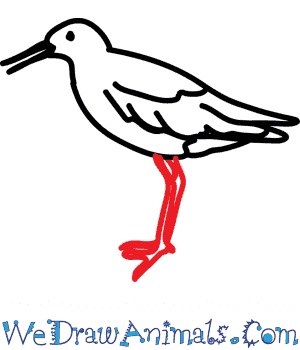 Attach the birds to the coastal areas where they are known to live and migrate, and you’ll have yourself a large visual demonstration of the migratory habits of the red shank.